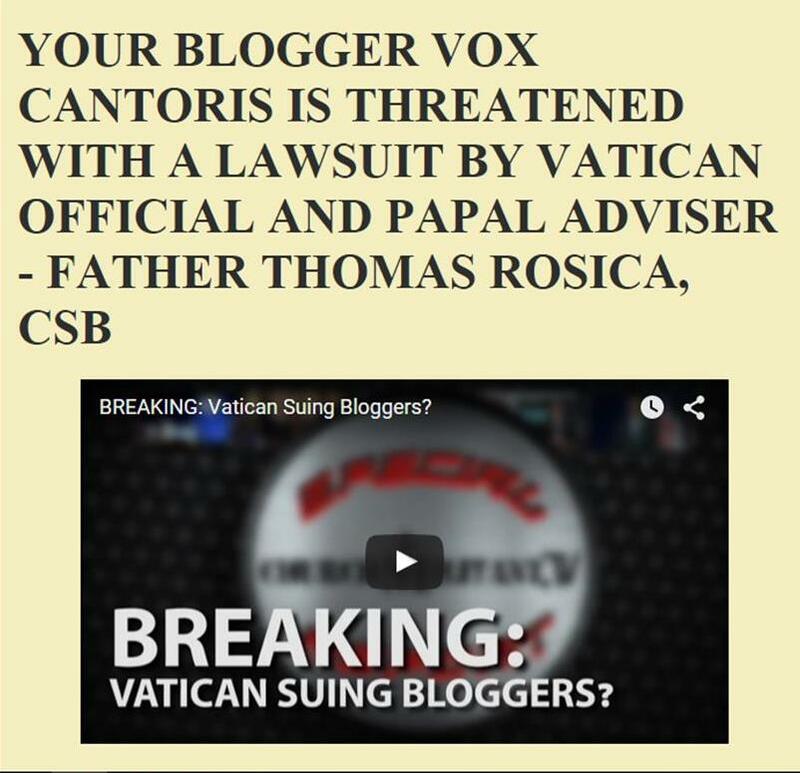 Vox Cantoris: Bergoglio's Urinating Witch! "We want him (John Paul II) to burn alive in hell. He's a swine. Even though a priest told me that a swine is to be eaten, this Pope is uneatable." I am sure that he preached to this witch, just as he did to Zuckerberg, about salvation through Jesus Christ. Yes of course he did. Yes, Jesus ate with sinners. Yes, yes, yes. Do you really believe that this Bergoglio preached Jesus Christ to this witch? I'm busy, lot's to do; can't write about this. Read it all for yourself, if you can keep from vomiting. Two-headed popes are bad enough, but I see the NWO sect is now talking about lay female cardinals - let alone deaconettes. As they say: THINK BIG! These are terrible times indeed, but what we are experiencing should give us comfort and hope; strengthen and deepen our Faith. Cardinal Manning explains the Great Apostasy, the Persecution, the Passion and the apparent "Death" of the Church — all these things which we are witnessing today. What has happened since the death of Pope Pius XII is not a contradiction of the Divine Plan any more than the Crucifixion was a defeat of Our Lord's mission. To the contrary: It is all part of the Divine Will; a necessary prelude to its final and complete fulfillment. What we are suffering now, in this time of ecclesiastical upheaval and confusion, is not a sign that God’s promises have failed, or that the gates of hell have prevailed. Rather, God’s promises are being fulfilled. Divine prophecy is happening at this very moment. So, let us take heart. Everything is going according to God's plan — the plan which is the Way of the Cross. As it was for our Lord Himself, so now is it mystically for His Bride, the Church. She must imitate her Spouse. For us a time of great sorrow and humiliation, but we are on the path — the only path — that will lead us to eternal salvation. We must believe. We must remain faithful. We must remain faithful to Christ and His Church, which is not the novus ordo conciliar sect of Don Mario et al.! Looks like Bergoglio is tossing pearls before swine. Will he set up a rigorist, Neo-Pelagian straw man for whom to apologize? After all, someone needs to get torn to pieces over the fact that the Eternal Word Made Flesh is Himself Truth Whom cannot change. Humans can't both indulge all their appetites and sanctimoniously assert moral superiority over political opponents? Someone's gotta pay! -Anybody but Jorge. At a loss of words! But shock ! Why would a woman known to loathe the Catholic Church travel to Rome to meet the Pope ? the whole encounter smacks of a publicity stunt .She did not know he was for the poor !,the Catholic Church has always ministered to the poor ,building schools,hospitals,orphanages.Anyone would think there's never been another Pope in the history of the Church who cared for the poor. "These are terrible times indeed, but what we are experiencing should give us comfort and hope; strengthen and deepen our Faith." Ah Peter, if only it was so! It's destroyed mine. They say "the road to hell is paved with the bones of bishops," and I figure it's because of their faith destroying actions, or in this case, inaction. Dear Dan, I get your drift. Truth is, the Catholic Church has left the building, but it's in the fields and the Faith hasn't changed by one iota. Sometimes the decadence we are fed all day long and from every side just gets too much and it oppresses us. That's the time to withdraw into a bit of solitude. Say the rosary daily, wear the brown scapula, read only books of religion published well before VII, assist at true Mass virtually and get as far away from the NWO church as possible. Shake the filthy dust from your shoes! c'mon, Susan...defend the shaking of fists at the lady, shunning her, and insulting her. Yeah, let's tell her that she's filth. Let us not extend love, mercy, and forgiveness to her. c'mon, Susan, defend that. Mark, seems to me that giving the lady a private audience is more of a political statement by this pope. I'm sure you see that also. Come to think of it Mark, this pope is known to make phone calls. The pope is making a political statement and does NOT care about offending good Catholics. We're not blind or gullible. Vox, I view the private audience between His Holiness Pope Francis and Hebe de Bonafini as a holy and beautiful act on Pope Francis's part. Pope Francis acted in Catholic fashion as he extended peace, mercy, and forgiveness Bonafini. Following her audience with Pope Francis, Bonafini said that she had asked forgiveness because she and her group had “been mistaken” about Cardinal Jorge Mario Bergoglio, according to Crux. Bonafini told reporters that "One has to ask for forgiveness when you make a mistake, and the Mothers do so." Bonafini years ago referred to our future Pope Francis as a "fascist." Now, she admitted that she had been "quick to judge" Cardinal Bergoglio. Pope Francis, in Christ-like fashion, said that despite the hatred that Bonafini had spewed years ago, it is his "obligation as a shepherd is to understand meekly. This lady, from the square (de Mayo), insulted me several times with heavy artillery." But Pope Francis noted that he is obliged at treat her with the "gentleness of a shepherd"
Vox, Bonafini came to apologize Pope Francis. He acted as Jesus Christ compels us to act. Pope Francis taught each of us a powerful lesson in meekness, mercy, and forgiveness. Pope Francis lives the Holy Year of Mercy each day. Vox, shouldn't our hearts and minds be filled with joy in regard to the mercy and forgiveness that Pope Francis extended to Bonafini? The way of the world is to shake our fists at Bonafina, insult her, and treat her like filth...to stick it to her for the horrific way that she had acted in the Cathedral...for the vile way that she had treated the future Pope Francis. Vox, the way of the Church is to extend the olive branch of peace to Bonafina, which is the way of Pope Francis. Dan, here is what His Holiness Pope Francis said about the story at hand. There isn't anything political in what he said. I will take his word about his reason to extend peace to Bonafina. Pope Francis said that it's his "obligation as a shepherd is to understand meekly. This lady, from the square (de Mayo), insulted me several times with heavy artillery." "But to a woman who had her children kidnapped, and who doesn’t know how or for how long they were tortured, when they were killed and where they were buried, I do not close the door. What I see there is the pain of a mother." Finally, Pope Francis noted that he is called to "treat her with the gentleness of a shepherd." That is beautiful. That is the way of a peacemaker. That is the way of a holy Catholic man. That is the way of a Pope who is serious about the Church's message of love and mercy. In regard to the extension of love and mercy, Pope Francis followed the lead of Pope Saint John Paul II. Pope Saint John Paul II met, forgave, and offered support to Ali Agca, a man who attempted to murder the Pope. Agca not only shot Pope Saint John Paul II, but Agca also wounded two additional innocent persons during the assassination attempt in question. Pope Saint John Paul II led by example when it came to teaching each of us to be a peacemaker who practices love and mercy. In that regard, Pope Francis just led by example in his having extended peace ane mercy to Bonafina. Dan, I don't find anything "political" in that. "Bonafini told reporters that "One has to ask for forgiveness when you make a mistake, and the Mothers do so." Bonafini years ago referred to our future Pope Francis as a "fascist." Now, she admitted that she had been "quick to judge" Cardinal Bergoglio." So, she apologised to the Pope for being "quick to judge" him. What about the public disgrace of urinating or defecating in a Church and the comments about Pope John Paul II? I mean, I've been harsh on Francis, but I've not gone that far. I want Francis to be a Saint, some day. How could I not? As I said, yes, meet with sinners, Jesus did, and I knew that was going to be something that some here, yourself included, would remind us all of. Public scandal requires public acknowledgement. Now, can he someone take up the issue of poor Asia Bibi? He seems to have time for everyone else! 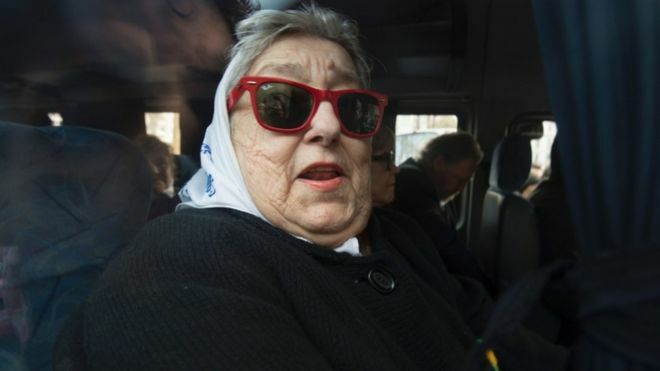 "Hebe de Bonafini has expressed support for figures such as Che Guevara, Fidel Castro, Augusto Sandino, Yasser Arafat, Hugo Chávez, Evo Morales, and the mothers of ETA prisoners." Vox said..."As I said, yes, meet with sinners, Jesus did, and I knew that was going to be something that some here, yourself included, would remind us all of." I hope that someone would remind us of that. We are Catholics. His Holiness Pope Francis is our brother in Jesus Christ. Therefore, when the Vicar of Christ, our brother and spiritual Father, was attacked for having extended the olive branch of peace to Hebe de Bonafini, then shouldn't we as Catholics have indicated that Pope Francis acted in Christ-like fashion? As Catholics, aren't we called to see the face of Jesus Christ in Hebe de Bonafini? Pope Francis did. So basically Mark Thomas is saying that Pope Francis only cares about the sins Mrs. Boney committed aganst him, not against Christ. And the mistake she made was thinking him to be Catholic, when in fact he is just like her, a socialist! But hey! Any friend of Soros is her friend as well! Dont you just love how Pope Francis, and Mark Thomas abuse the gift of mercy to cover negligance and treason against Christ? Remember too that the pope said "the meeting is the message" when meeting an imam. He knows the "messages" he is sending. Johnno, did I say that or did you say that? Anyway, the bottom line is that His Holiness Pope Francis obeyed the teachings of Jesus Christ and His Church. Jesus Christ reached out to sinners and outcasts, to people who were despised and hated by "righteous" folks. Pope Francis followed the lead of Jesus Christ, whom the "righteous" of his day despised. Pope Francis was the Good Shepherd who extended the olive branch of peace to a woman who acknowledged her mistakes. Pope Francis extended love, mercy, and forgiveness to Hebe de Bonafini. Johnno, you are on board with the above. Correct? How very rich coming from someone who tried to slander another Catholic using deliberate misquotation. Once you apologize here publicly to Chris Ferrara and the Remnant for your calumny, then maybe you can be one to talk about olive branches without the rest of our laughing and pitying you when not praying for your warped soul. Please point out where Pope Francis or Bonafini admit to any of the things you attributed to the reasons for their meeting. Direct quotes please. Where did Pope Francis or Bonafini mention anything about Francis bringing her back into the Church and correcting her for her sins against Jesus Christ. Because otherwise my interpretation of the very things you quoted holds more consistency than the sugary nonsense you made up. I'm not a modernist like you so no, I am not on board with your Satanic understanding of 'love, mercy, and forgiveness.' Especially given your sheer unashamed hypocrisy against Ferrara and the Remnant. So let's see you follow Bonafini's steps and apologize.